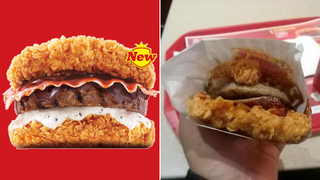 In South Korea, KFC's take on the Double Down is, well, something else. You might have seen the promotional pics. Let's have a look at pics of the actual sandwich. While the Double Down that was launched in 2010 in the U.S., it was two pieces of fried chicken with cheese, sauce, and bacon. KFC Korea's version is called the Zinger Double Down King, which is made up of two pieces of spicy fried chicken, bacon, BBQ sauce, pepper sauce, and a beef patty. As Realtime Korea reports, the $7 sandwich clocks in at 750 calories. Above is an ad for the Zinger Double Down King. The real deal, of course, looks different. Some will say it looks horrid. Other will say it looks wonderful. So, you ready to do this? [Photo: LiTaNia_ST] This actually happened. [Photo: qorghtn2000] There's no turning back now. [Photo: sttarttu] Mmm... Delicious regret. [Photo: efkmtoho] Finally! A sensible person. [Photo: efkmtoho] What was I saying? [Photo: klsm0308] So not screwing around here.